On a lightly floured surface, roll 1 dough dish to 1/8 inch thickness. Cut 4 (6 inch) circle from dough. Transfer to 4 (4 inch) mini pie or souffle dishes, letting dough fall into place. Trim edges to ¼ inch past rim of pie dish. Fold edges under, and gently pinch between the index finger and forefinger to creat wavy edge. Cover with plastic wrap, and refrigerate for 30 minutes. Roll out remaining dough disk and repeat steps. Prick bottom and sides of dough with a fork. Bake until edges are pale 8 to 12 minutes. In alarge saucepan, cook strawberries, rhubarb, and ½ cup sugar over medium heat, stirring occasionally, until berries are tender, about 8 minutes. Strain fruit, reserving juice. In a medium bowl, whisk together 1 cup reserved strawberry rhubarb juice, remaining ½ cup sugar, tapioca flour, and salt. Add strawberry rhubarb mixture to juice, stirring gently to combine. Pour into prepared crusts. Place pies on a rimmed baking sheet, and bake until filling is bubbly and crust is golden, about 20 to 30 miuntes. Transfer to a wide rack, and let cool for at least 3 hours before serving garnish with Coconut Whipped Cream and toasted coconut, if desired. In a small saucepan, heat cream over medium heat until just beginning to bubble. Remove from heat, and add coconut. Let steep for 10 minutes, or until cool. Strain cream, discarding coconut. Place in a airtight container, and refrigerate until very cold, approximately 2 hours. In a medium bowl, combine cream, confectioners sugar, and salt. Beat at medium speed wityh an electic mixer until soft peaks form, about 3 minutes. 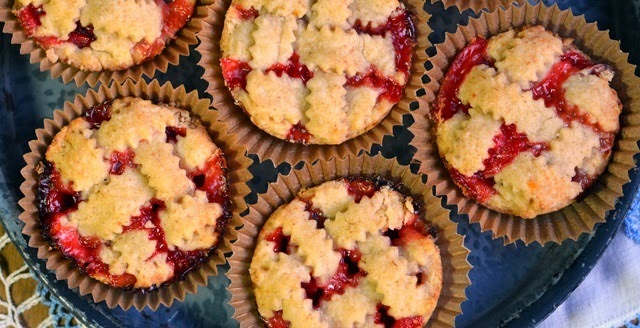 Serve with Mini Strawberry Rhubarb Pies. In the work bowl of a food processor, pulse together flour, sugar, salt, and any dry additions to pie doughif dedired. Add butter and pulse until mixture is crumbly, about 1 minute. Combine ice water with any wet additions to pie dough, if desired. With motor running, slowly add ice water. Continue blending until mixture form a ball. Shape dough into 2 disk (1 for half ricepe), and wrap tightly in plastic wrap. Refrigerate until firm, approximately 2 hours.